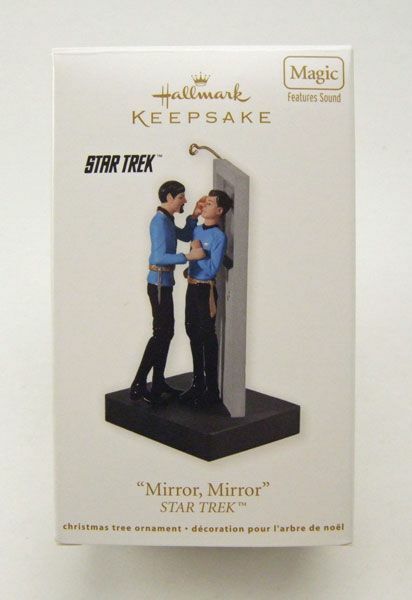 A Piece Of The Action: Hallmark Ornament Spotlight- 2011 "Mirror, Mirror"
The Rundown: So... how was your weekend? Mine was good. Did some work around the house, spent $80 on ornaments, had some family fun time... ya know, the usual stuff. Wait- $80 spent on ornaments!?! In the middle of July!?! That's right folks! In case you forgot, Hallmark premiered their new ornaments this past weekend. So if you buy their new releases each year at the earliest possible moment like I do, then you have three brand spankin' new ornaments to rush out and drop 80 smackeroos on! 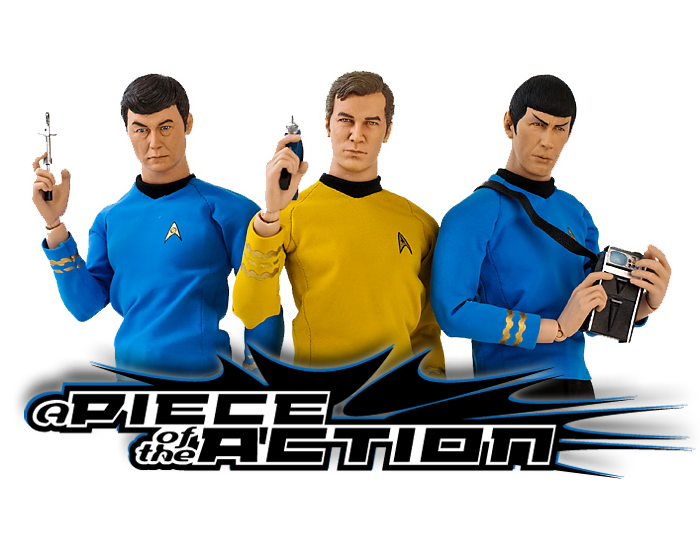 This year's Star Trek ornaments all focus on TOS, with a Romulan Bird-of-Prey in the ships series, a standard Spock figure continuing the "Legends" series, and a "Mirror, Mirror" ornament figuring into their "Magic" releases. Today, we'll be taking a look at the "Mirror, Mirror" release. 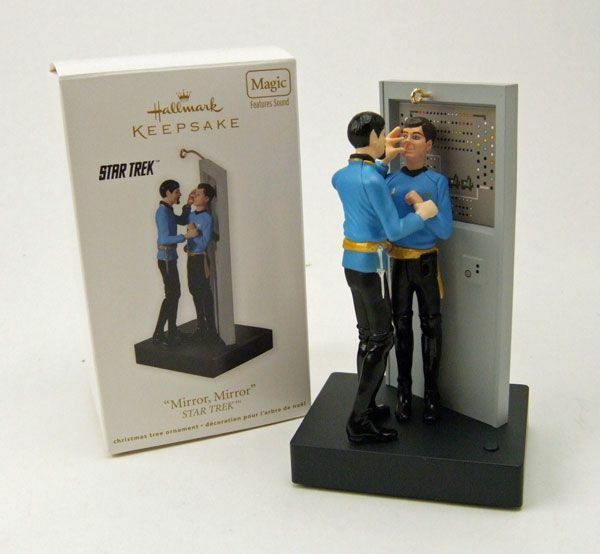 Recreating a pivotal scene from the classic episode "Mirror, Mirror", the ornament features Spock and McCoy moments before the Vulcan initiates a mind-meld with the good doctor. It's a great scene from a great episode; Definitely worthy of the ornament treatment. The ornament stands at just under 5" tall, with each figure coming in at under 4". Hallmark has done some great work at even smaller scales than that, so I expected the work on these guys to be pretty sharp. Unfortunately, the sculpts just aren't as strong as they should be. McCoy is definitely my favorite of the two, but he isn't without problems. 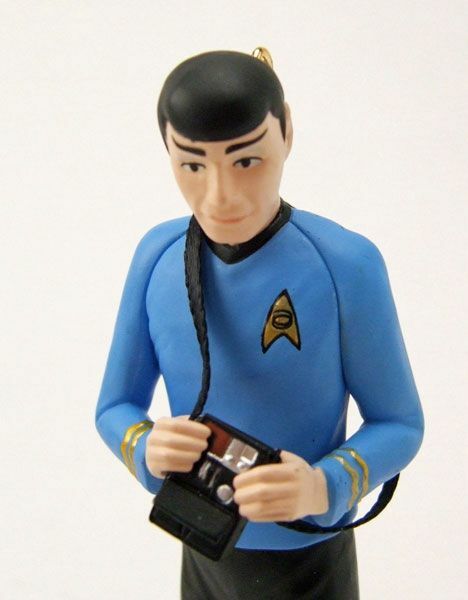 While the sculptor did a decent job of capturing McCoy's likeness, the face just doesn't convey the bewildered look that Bones had during the scene. He almost seems happy, like he's kinda looking forward to the meld... which is weird. 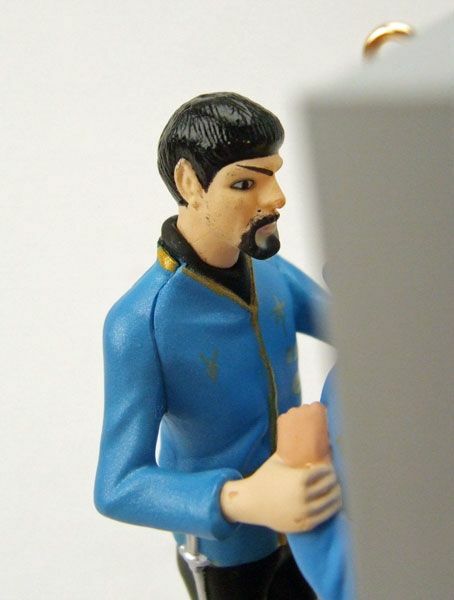 "Evil" Spock fares even worse in my eyes. The head sculpt doesn't bare much resemblance to Nimoy, and the body has almost cartoonish proportions (particularly the arms). Not only that, but details like the chest adornments on both figures are simply painted on instead of being sculpted. Bummer. 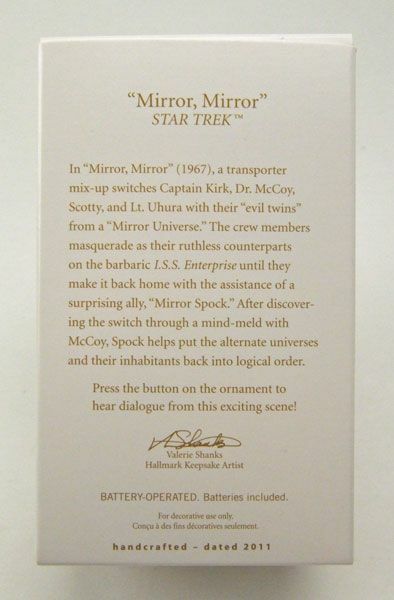 Now it may sound like I'm being a tad harsh on this release, especially given the fact that this is a fairly small ornament... but after having recently spotlighted the much smaller "Wrath Of Khan" ornament, I expected cleaner work from this one. I was pleasantly surprised when I turned the ornament around though! 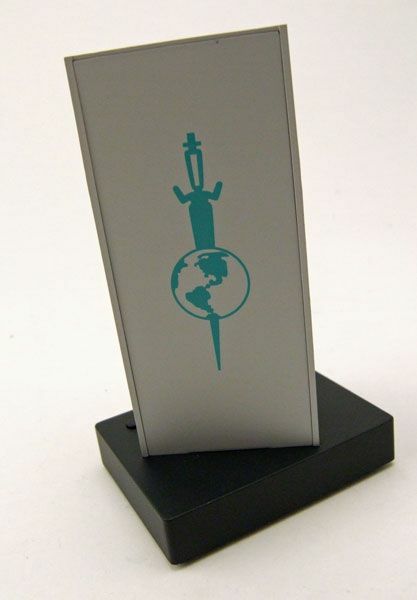 The back wall of the ornament features the "Terran Empire" logo... of which I am a big fan. ;) Nice touch Hallmark! Pretty cool, eh? Sadly, there is only one sound effect though. Sure, that's all you need for the scene, but I still feel like they could have put another line or two in to really spruce this one up. I do continue to be impressed by Hallmark's sound chip work though. They always seem to hit the perfect balance between volume and clarity. Oh, and just like the releases of the past few years, "Mirror, Mirror" runs on batteries, allowing you to use it as a display piece during non-seasonal months. 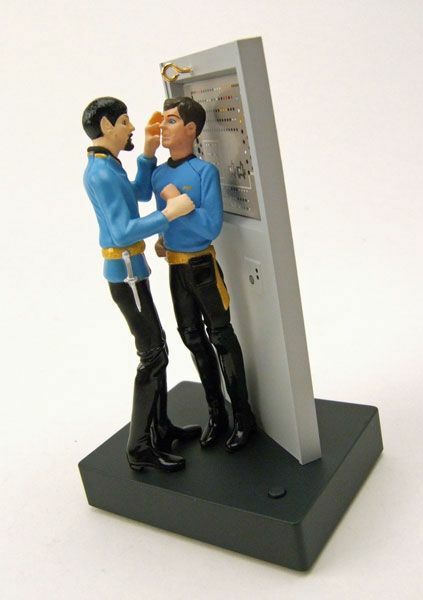 While it does have some sculpting issues, the "Mirror, Mirror" ornament still makes a cool display piece from one of Trek's all-time great episodes. What hurts this one though is the price- At $29.95, slight drawbacks like a weak sculpt and a solitary voice clip make dropping the money down on this release a bit painful. I hate to say it, but you may be better off waiting for the inevitable year-end clearance on this baby. Unless of course you have no patience like me... Then you're screwed. Did he fare batter than "Mirror, Mirror"?.... Come by tomorrow to find out! 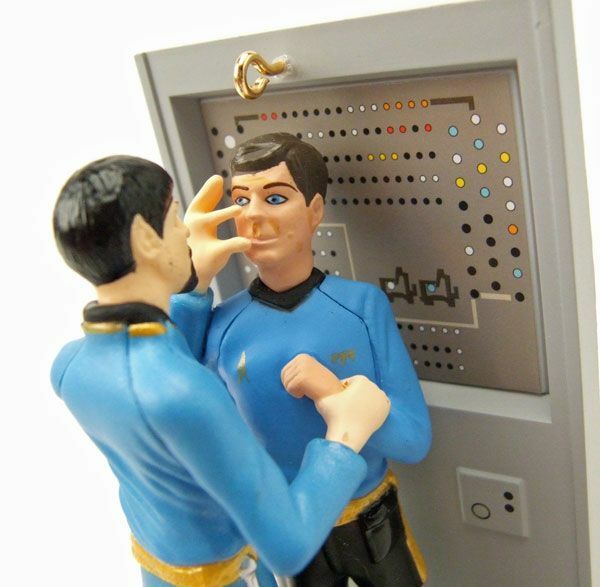 McCoy looks happy because he thinks Evil Spock is about to give his cheek such a pinching! Hey Guys! The omnipotent and mercurial Q himself, Mr. John de Lancie, will appear in one of the projects that Beth Roose is lining up in a couple of months. Betty Roose Productions is holding auditions for voice talents at the Reliant Park World Series of Dog Shows in Houston. The event will also feature a few Hollywood celebrities this year and opportunities for children to audition for speaking roles in a series of animated films. For more information, check out our sites, bit.ly/oJISz7.